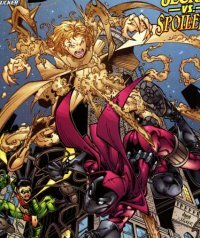 Secret was once an ordinary girl named Greta, whose adoptive brother Billy killed her as part of his plan to become the supervillain Harm. Because of the manner of her death, Greta remained stuck on this plane of existence, a gateway between the living and the dead. Secret originally had the powers to become ethereal, teleport, shape-shift and take souls to the "other side". She has since been depowered. She was a member of Young Justice along with Robin, Wonder Girl, Impulse, Superboy and several others. She was often quite unstable thanks to her troubled past and nursed a huge crush on Robin. She learned he had a girlfriend and in a jealous rage, followed him to Gotham City. Meanwhile, Spoiler was having her own problems with Tim, trying to follow him and find out his secret identity. He caught her, and she went home, but wrote in her diary she wasn't going to give up finding out who Robin really was. Suddenly, Secret appeared in Stephanie's room, berating her angrily and threateningly for following Tim around and "invading his privacy". Stephanie recognized her as "that mist girl from Young Justice that Robin always talks about!" This distracted Secret enough that she became solid and asked, "He does?" Steph then claimed she lied and kicked Secret in the face, very torqued that Secret's had been reading her diary and was invading her room. At Secret's demand, the girls took their fight outside. It turned into more of a pursuit of a reluctant but angry Steph by Secret, as Secret continued to scream at her. Steph tried to defend herself and ended up climbing up a telephone pole, yelling in response to Secret's barbs, "You don't know anything about me and Robin, so shut up!" Secret responded that he deserves someone better, "Someone like..." and Steph snorted, "YOU? Are you even human?" To which Secret took offense. Steph cut some electrical wires loose with a blade in an attempt to slow her aggressor down. Secret screamed and dissipated in a misty explosion (electrical wires are a weakness of Secret's, because her death involved electrocution). Spoiler panicked,thinking she'd killed her, but Secret popped back up, hopping mad, and Spoiler barely dodged her giant fist. The girls took their fight to higher ground, Spoiler desperately trying to make amends as Secret's rage mounted. She suggested that maybe Secret had a point about privacy and they could talk about it, but Secret was not moved, snarling, "The time for talking is past," as she enveloped Stephanie in mist. But Steph is saved by Red Tornado, who whirled Secret up in his...tornado. She screamed, "Reeedddy! I wasn't going to hurt her, just scare her!" Tim checked to make sure Steph was okay. After that, Tim treated both girls to a lecture about trust (Stephanie was not impressed when Tim mentions himself and Batman as an example of people who trust each other). He made them promise not to fight again, and both girls agreed, but with their fingers crossed behind their backs. The two met again in Young Justice #50 when Spoiler came to help the team with a mission. Stephanie asked Secret if they're cool, and Secret replied icily that she won't be giving Stephanie any trouble. But Secret's inner turmoil is pushed to the limit when her friends try to stop her after she breaks her father (condemned to death row for murdering her evil brother) out of jail. As a result, she was manipulated by the evil god Darkseid and joined him. After a couple weeks, she returned to take revenge on all the people she felt had wronged her. After she went after the DEO, a lab that had captured her, tortured and experimented on her in the past, Robin realized in a panic that she would eventually get to Stephanie. He called Spoiler up, asking her if she remembered Secret. "Sure, kind of hard to forget someone who tried to kill you. But everything seemed cool between us last time we met." Robin told her things might be heating up, and asked her if she would go out of town for a few days. But he was too late, Secret had already appeared to attack Stephanie in the middle of their conversation. Steph immediately ripped out some electrical wires, waving the sparking things at Secret and yelling at her to stay back. Secret merely laughed at this, saying she'd overcome that weakness. Steph ran for it, jumping off the roof with her grappling hook, yelling, "Get away! I never did anything to you!" Secret replied, "Oh, you did. You absolutely did. You lived." And she sucked out heroine into her mist, most likely into the abyss, a hellish place between life and death that Secret was a portal to. Robin was screaming Steph's name into the phone when Secret picked it up and said, "Too late," and told Young Justice she was going after them. In the next issue, Robin talked Secret down, and she released everyone she'd sucked into the abyss, obviously including Stephanie, with no memories of their experience. Secret is turned into a mortal by Darkseid as punishment for this rebellion, but this is really what she wanted all along. Learn more about Secret here.